Sandy shared a positive review of this product. I love these laundry sheets. I have a front loader washer, and these sheets work wonderfully. Only one problem.....our major grocery stores have discontinued them. We are having a hard time finding them. Right now, Walmart is the only place we can find them. I hate it when a grocery store introduces a new item that you absolutely love, and then it's gone! Sandy, you're right that less and less stores appear to be selling this product. I love them and now I can't find them in Market Basket, Shaw's or KMart here in New England. Bummer. Don't like the new detergent pods that seem to be the newest thing for many detergent makers. Help! I do still see some versions of them at Walmart as you mentioned above (you can click the link above for the store to purchase it through my affiliate link). In addition, they are also still available online through Amazon. I'd love for others to share what stores they still see them in too, for those who don't like to purchase products online, but instead like to head to a physical store. Hope that helps! I received this comment from Misty on SR101's Facebook wall about Purex 3 in 1 laundry sheets. We used them when we were on vacation and our condo had a washer and dryer. I didn't notice any spots or stains on the clothes. It made it very convenient and it was great coming home with almost all the clothes clean and ready to just go back into the closet or drawers! Thanks Misty for sharing your experience with this product. You make a good point. If they don't cause spotting and staining for you, they would be quite convenient for taking on trips for doing your laundry. They would be easy to pack, and not take up much space or weight in your suitcase! Great idea! Cindy has shared her story of using the Purex 3 in 1 sheets. I have used the Purex Complete 3-in-1 laundry sheets for over two years and loved them--- until now. I started using them when I had a top loading machine. They are great and so convenient. When I got my front loader about 10 months ago, I naturally continued using the sheets -- after all they are marketed to both types of washers. I thought my brand new machine was broken after only 10 months of use when it would not drain or cycle through to complete the wash. I was really surprised when the repairman found a laundry sheet stuck in the drain. Unfortunately, I will not be able to use them and will reluctantly be switching to a new product. I can't afford to have my machine serviced every time a sheet gets sucked into the drain. Having a sheet clog the drain even once is one time too many. Cindy, thanks for sharing your story. Too bad you had just stocked up on the sheets right before this happened. Has this happened to anyone else with the Purex 3 in 1 sheets? I've heard of little socks, like baby socks, getting sucked down the drain before but not these sheets. Perhaps you could learn how to fix this issue yourself, whether you continue to use the sheets or not. Unfortunately, small items may occasionally get caught in there and I know you don't want to call the repair person each time. Another idea, for either using the sheets or for little items would be to use them in a larger mesh bag that you throw in the wash. That way little stuff won't go down the drain. Just an idea I had, but I don't guarantee it works. So, does anyone else use the Purex laundry sheets, or any other Purex laundry products? If so, please share your Purex laundry detergent reviews here, or read other reviews already submitted. Mike provided a Purex 3 In 1 laundry sheet review, and wasn't happy with the detergent. I tried the Purex 3 in 1 laundry sheets and am very disappointed. I washed a very expensive set of Egyptian cotton sheets in my front load washer using one of these sheets. They came out of the washer clean, as they should be. I put the sheets in the dryer and put the 3 in 1 sheet in as well (as the instructions tell me to). My expensive Egyptian cotton sheets came out with grease spots all over them and are now ruined. I cannot get the spots out. I emailed the manufacturer and they did not respond. I searched the Internet and found many complaints of ruined clothing, all with grease spots from this product. In my opinion this product should not be on the market. The strip on the sheet that is the fabric softener is a thick waxy strip. When it melts in the dryer you get grease spots. I have heard though that this doesn't happen with towels. I don't know why, but if you like your clothes, do not use this product. Mike, I'm sorry to hear that the product did not work well for you. I had not personally heard of this before, but I definitely am going to be doing more research on the issue. As a side note there are some good stain removers which are designed to remove waxy stains, like candle wax or gum residue which might be able to help you too. I'm not sure, because I haven't experienced this issue personally, but if the sheets are already ruined you might want to give it a try. The two products I would recommend are Goo Gone and Carbona Stain Devil #1. 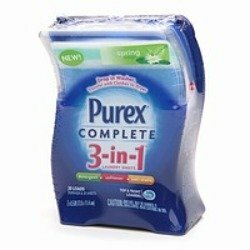 If you use these products successfully (or not) I would love to hear back from you to share your results, so other people that have this problem from the Purex Complete 3 in 1 sheets will know whether this possible remedy for fixing their clothing that seems ruined works or not. Further, normally it is fabric softener liquid that causes the major stains, although dryer sheets have also been known to cause stains on clothes too, which are described as grease spots. You may also find these instructions for fabric softener stain removal helpful. In addition, I would love to hear from others who have used the Purex 3 in 1 sheets, to tell me if you've had this problem. You can share your own Purex laundry detergent reviews here, or read other reviews already submitted. In addition, you can also share your own laundry detergent reviews here, for any brand, to tell me which detergents you like (or don't) and why. Below is a video review of Purex Complete 3 in 1 laundry sheets from a fellow Purex Insider. Basically, Purex Insiders are a group of bloggers that Purex has invited to test their products and give feed back on them, sometimes before they are even available in stores. 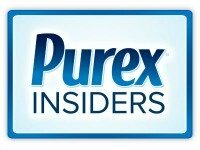 I just recently was selected to be a Purex Insider, and therefore I have just started learning more about this brand of laundry detergent and other laundry supplies. Basically, the video suggested that this would be a great product to take on a road trip, where I knew I would need to wash clothing but where I didn't want to pack a big jug of detergent. In addition, you can share reviews of other laundry detergents here, telling me which you think are the best (or worst), and why. Crystal shared her experience with this product. I washed my sons bedding in this and the next day he had hives all over his upper torso, more dominant on the side where he put the sheet under his armpit. His armpit on that side was all hived out and bumpy, red and raised. Sorry to hear about your son's allergic reaction Crystal. I hope he feels better soon. It sounds like you son may have some laundry detergent allergies as you guessed. If you want to continue using this product, they do have a scent free version which may work for you. Or, Purex has other free and clear versions to choose from which I've thought were pretty good. Finally, you can also review this list of hypoallergenic laundry detergents to find something that will work for his sensitive skin! Hope this helps. Has anyone else experienced allergic reactions from this product or otherwise want to share your experiences with it? If so, I'd love to hear from you. You can share your review here. These worked great for most items, but when I put one in with a knit sweater, the sheet stuck to the fabric and left a blu-ish stain on the shirt (it is a similar color to the detergent strip). The sheet was literally attached to the shirt so I know that it came from the strip. It was a brand new shirt (2nd washing). I will use it for towels but not on my other clothing, until I have used the rest of the box but after that I will not be purchasing this product again. Beth, thank you for sharing your experience with the Purex Complete 3 in 1 laundry sheets. I'm sorry, however, that it wasn't positive for you. The bluish stain you are referring to may be a fabric softener stain, although I cannot know that for sure. You may want to try the recommendations for fabric softener stain removal to see if you can salvage the shirt. Be careful though since it is knit, because this is more delicate than some other fabrics. Has anyone else experienced this problem of the sheet literally sticking to the clothing? If so, please share your experiences with me. Also, has anyone figured out what causes this, and have a way to prevent it? You can share your Purex laundry detergent review here, or read even more reviews already submitted. In addition, you can share your laundry detergent review here, for any brand, telling me what you like, or don't, about it. I love the Spring Oasis scent of the 3-1 sheets. Why can't they make it in liquid? We LOVE these 3 in 1 sheets for traveling. I cut them into thirds and they are just right for washing a sink load of clothing when traveling. you don't have to worry about the "bottle" leaking, they are light and they go a long way. I wish we could still find them. So great for a traveler. I have checked the Wal Mart site, and my local Wal Mart, and they no longer carry them either.